Newport, RI Plans for a new 57-room, four-story hotel are moving along. Located at the corner of Long Wharf and America’s Cup Ave., the new hotel will replace a two-story building which formerly housed a Hooley store and the Corcoran, Peckham, Hayes, Leys & Olaynack PC Law Firm. Developers of the proposed hotel, Farrar Equities, LLC and Crosspoint Associates, Inc., have named the boutique property the “Brenton Hotel” after Brenton Reef located at the entrance to Narragansett Bay. 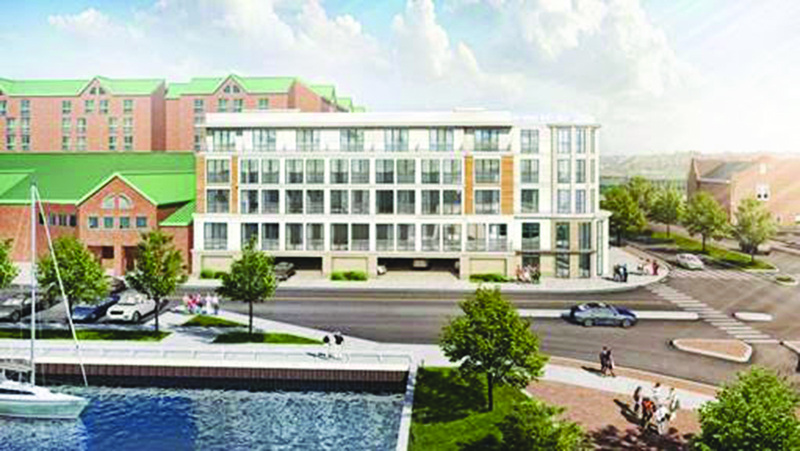 The property will feature architectural details that honor the historic buildings of Newport, while its guestrooms and suites will provide modern comforts. A lounge, dining, and common area will be located on the first floor. Farrar and Crosspoint have teamed with Dan Paquette, CEO of Sterling Construction Management, LLC and Behan Brothers, Inc., general contractors, to construct the hotel. The team is also working with Group One Partners of Boston and DiPrete Engineering. DiPrete Engineering provided engineering and surveying services and worked with the developers to secure permits for the project from the Coastal Resources Management Council (CRMC), the City of Newport and the Rhode Island Department of Transportation (RIDOT). The harbor front building will be raised above what is required in preparation for sea-level rise and parking spaces will be underneath the hotel on the ground level. Demolition has begun and construction will begin next month. The Brenton Hotel is expected to be complete by summer of 2020.